The Google Machine says Amalgamated Transit Union Local 689 represents the workers of the Washington DC Area Transit. Amid these setbacks, the fight against Mr. Trump's executive orders has taken on an added urgency among many public-sector union leaders. "We are very pleased that the court agreed that the president far exceeded his authority, and that the apolitical career federal work force shall be protected from these illegal, politically motivated executive orders," Sarah Suszczyk, the co-chair of a coalition of government-workers unions, said in a statement. The White House did not immediately comment. Trump was at his golf course in Sterling, Virginia. Maybe many federal employees will be extra sure to vote for the Democratic Party candidates this November. President Trump announces that he's canceling pay raises for most federal employees that had been set to go into effect in January, citing government budget concerns. Wouldn't it go over better if he cut back on golf and campaign rallies? Wonder if his top WH staff suckups will get their raises? Jeesh. I mean. SOMEONE has to pay for those tax cuts. America is doing GREAT! Best economy ever. Sorry, federal workers, can’t afford raises. Military should skip raises to pay down debt. And who was it that was going to have to pay for that bigly parade he wanted? The president can make such decision regarding federal pay if there's a national emergency or serious economic conditions warrant. I would not be surprised if there's a lawsuit, as the president likes to remind everyone that this is best economy ever. This smells "capricious." The reality is there's a big "locality adjustment," i.e., increased pay for those living in expensive areas, i.e., mostly blue-state big cities. More payback. No raises for federal workers. But there is enough money to fly Trump and his family back and forth from Mar a Lago? Everybody gets a locality adjustment. Everybody is in a locality, if you are in the United States. There are currently 47 localities that cover the entirity of the United States. There was a plan to enter another 2 localities, if I remember correctly, but those have probably already been put on hold. If Mr. Trump got rid of locality pay (which he falsely stated that the "increase" was going to be 25.7%, instead of the totality of the locality pay), with no corresponding adjustment to the base pay, Federal Employees would take a 25% pay cut across the board. Congressional Republicans have tentatively agreed to a 1.9 percent pay raise for the nation’s 2 million civilian federal workers, overruling President Trump who sought to freeze their pay. The preliminary deal between House and Senate Republicans is also likely to lift a salary freeze affecting hundreds of executive-level employees and appointees including Vice President Pence and members of the Trump Cabinet, according to lawmakers and aides. The average federal worker salary is around $85,000, according to the federal Office of Personnel Management. But the American Federation of Government Employees, representing about 750,000 federal workers, says that number is inflated by the high salaries of some doctors and scientists, and that the bulk of federal workers make between $33,000 and $55,000 a year. Around 15 percent of the nation’s 2.1 million federal workforce live in and around Washington, D.C. The majority of the 2.1 million work all over the nation at military bases, federal labs, national parks, veterans hospitals and other facilities scattered throughout the states. 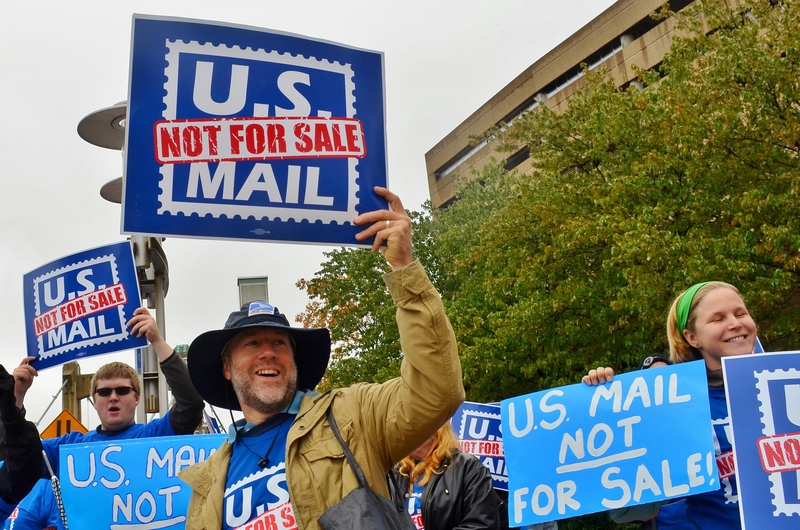 Letter carriers, postal workers, mail handlers and other USPS employees in Minneapolis — and in communities across the country — rallied today with supporters, putting Trump and federal lawmakers on notice that the U.S. mail should not be for sale. “As long as we can fight, we’re going to keep fighting to keep our Postal Service going strong,” said Harold Harvey, a member of St. Paul-based Branch 28 of the National Association of Letter Carriers, as he walked an informational picket line outside Minneapolis’ downtown post office. The president can’t sell off the Postal Service without the approval from Congress, and in just three months since Trump pledged action on the issue, a majority of House members and 42 senators have signed onto resolutions in support of keeping the agency under federal control. Minnesota Sen. Tina Smith and all five DFL House members are among the resolutions’ co-sponsors. It may be no coincidence, then, that the recommendations of Trump’s hand-picked task force on postal reform, delivered to the White House in August, have not yet been released to the public. Her argument is that the agency isn’t allowed to have a union under the 1978 Civil Service Reform Act. She says that the Agency is specifically exempted and thus she’d be breaking the law to recognize the union. I’m no expert on the law. But it’s worth noting that the law is 40 years old. So no other chair in the last 40 years thought this was a problem. Government Executive magazine also notes a 1980 DOJ opinion which held that this was not what the law said. The issue seems to be a provision that DOJ decided was about preventing conflicts of interest rather than preventing the Agency’s employees from having a union. President Trump nominated now-Chairwoman Colleen Duffy Kiko in September 2017 and she was confirmed by the Senate in November 2017. WASHINGTON (AP) — The Merit Systems Protection Board, a quasi-judicial government body tasked with settling workplace disputes for millions of federal workers, is officially vacant for the first time in its 40-year history. The board became empty at midnight Thursday, after the Senate failed to act on a measure to extend the term of the board’s sole remaining member and acting chairman, Mark Robbins. The House approved the extension Monday. The three-member board needs at least two members to decide appeals from civil servants. All three members are presidentially appointed and Senate-confirmed for staggered seven-year terms, with no more than two affiliated with the same political party. After one member termed out in 2015 and a second did so in January 2017, both without replacements, Robbins became the board’s sole member. His term expired at midnight on Feb. 28. President Donald Trump nominated two members to the board, including Robbins’ replacement, after one year in office, and nominated a third months later. But the nominees were not approved by the Senate before the end of the last Congress. One of those nominees withdrew his name from consideration, and the other two are still under consideration. Employees in Vermont’s state’s attorney’s offices overwhelmingly voted to join the Vermont State Employees Association Friday morning. The deputy prosecutors, victim advocates and secretaries voted 59-12 in favor of the unionization. The employees — numbering 110 across 14 counties — had been discussing unionization for several years, leading up to a December 2018 vote by the VSEA Board of Trustees to proceed with an election. “This is really great news for the OSA workers, and I applaud them for their decision to band together as a unit to work with VSEA to get the wages, benefits and working conditions they want and deserve,” VSEA President Dave Bellini said in a statement. Bellini said the VSEA will now begin the bargaining process to get the new members a “fair and just” first contract that addresses their key concerns, and gives the workers a voice in day-to-day operations like caseloads, staffing and allocation of resources. The Office of Mayor Sylvester Turner said in a news release Friday afternoon that the 60-day notices impact workers at the city’s Parks and Recreation, Library, Administration and Regulatory Affairs and Health departments. Last week, 67 fire cadets received notice they will be laid off. The City Council is scheduled to vote on layoffs of firefighters next Wednesday, April 17. The pending firefighter and municipal worker layoffs are directly tied to the city’s implementation of Proposition B, which voters approved last November and establishes pay parity between the local and fire departments.